(CBS/WTOL) TOLEDO, OH - A mourning Northern Ohio community came together Sunday night to remember a Johnny Clark and Lisa Straub, a young couple violently murdered on January 31 in Straub's parents' home. 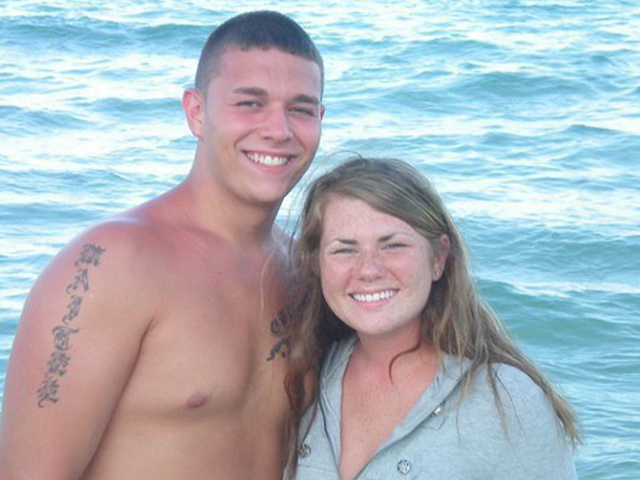 Sunday was the six-month anniversary of 21-year-old Clark and 20-year-old Straub's death. There have been no arrests in the case, reports CBS affiliate WTOL. Clark's parents, John Clark, Jr. and Maytee Vazquez-Clark, found the couple in the early morning of Jan. 31. John Clark Jr. kicked down the door of the Springfield Township home and saw his son and his son's girlfriend on the floor, reports the station. Both had their hands bound with black tape and plastic bags over their heads. According to the medical examiner both died of asphyxiation. "I found them and I ripped off the bag off my son's head," John Clark, Jr. said. "Then went to her and did the same." Robbery is believed to be the motive. Authorities continue their investigation. Straub's parents were on a cruise while the two were in their home, according to the station. Family members say Clark picked Straub up from work at T.G.I. Friday's Sunday night and drove her home to her parents' house, and they became concerned when they couldn't reach Clark . Anyone with information that could help police is urged to call Crimestopper at 419-255-1111.